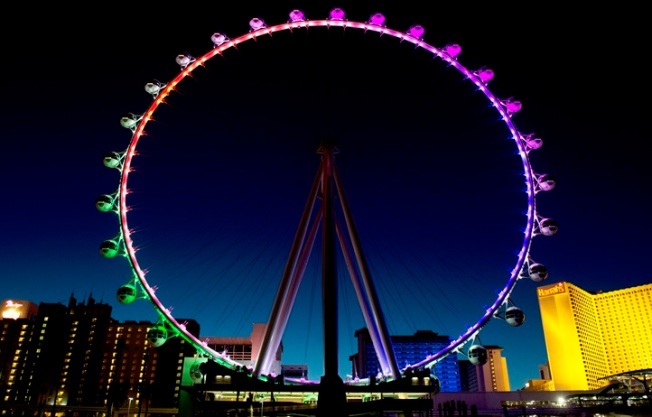 Weddings on the giant Ferris wheel will be the theme of the magical Vegas day. WEDDING ON THE WHEEL: If you've ever been involved in nuptialing before, either as one of the people taking the vow or as an attendant or family member, you know that a certain sense of movement can set in, a blur, if you will, as bouquets and caterers and limo rides and hotels are all lined up. But actually having a wedding on the move is something quite unusual; generally two people stand still, before an officiant, and repeat their vows. Even in drive-through chapels, those Nevada kitsch-colorful icons, the car comes to a stop, so the merry marrying people may say the words they need to, to secure that license and their future together. But a whole veiled-up, tuxedo-cool group of adventurers will actually and honestly get married on the move on Saturday, Dec. 13. The not-so-stationary place staging the exchanging of the rings? The High Roller, at The Linq in Las Vegas. The reason? Saturday, Dec. 13 happens to be 12-13-14, "the last sequential date of this century." Yes, for sure, the rare occurrence is holding a lot of whimsical water for people looking to get hitched, and, perhaps in part, find an anniversary that's a snap to remember. SO IF YOU MAKE... for the High Roller on 12-13-14, look up: Several "in-cabin" weddings will be going down. (Or, more accurately, up, and then down.) Some couples will be marrying, while others will be renewing their vows. The weddings kick off at 10:11 a.m. and wrap at 12:13 p.m. -- check out the nicely sequential nature of those two times -- and, you guessed it, all of that nuptialing will be happening simultaneously, so one of the most famous Ferris wheels in all the land truly will be, for a couple of hours, a circle of love. IF YOU'RE NOT MARRYING... on 12-13-14, you can still call upon the Strip-close wheel on another date. It's $24.95 to ride the 550-foot High Roller, which is billed as the World's Tallest Observation Wheel, and, yep, entire cabins can be rented for a higher fee, if you're looking to do some proposing or have private time with pals. But the real question is if you can see your house from the top of the High Roller. Almost, right? Regardless of where you live? Those Vegas vistas do stretch on, practically into the next century.